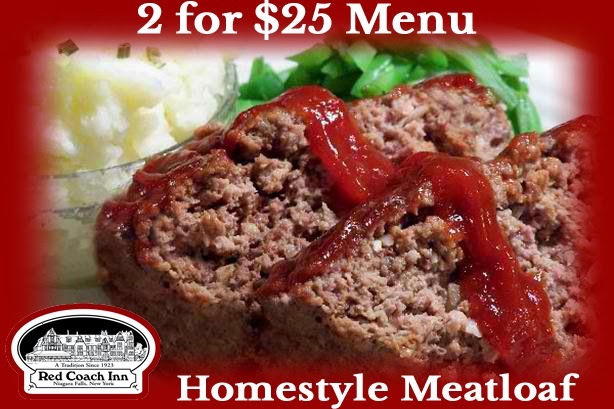 New 2 for $25 Menu! 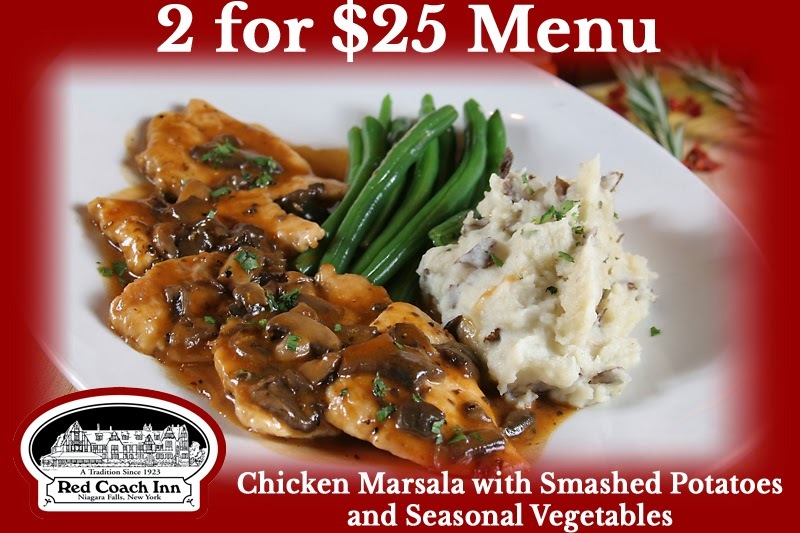 For a limited time the Red Coach Inn will be offering a 2 for $25 menu for lunch and dinner! Stop by and check it out today! This month's featured staff member is Stephen Hamilton! 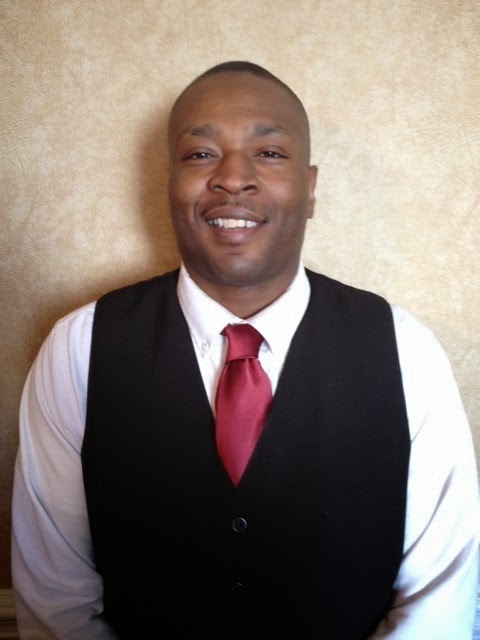 Stephen is a Bartender and Server, and has been with us since June of 2013. Stephen has superb customer service and he ensures each guest enjoys their experience in our restaurant. What is one thing about you that might surprise people? "That I love sci-fi and comic books." What is your favorite holiday? "New Year's"
What is your favorite city? "San Diego"
If you could trade places with anyone for a week with whom would it be? "Michael Jordan"
What is your favorite place in Niagara and why? "Lewiston by the river, it's peaceful"
What are your favorite movies? "Star Wars, Forrest Gump, Training Day, and Lord of the Rings"
If you could live anywhere in the world where would it be? "Brazil, for the food!" Each month we choose a room to feature and highlight in our Featured Room of the Month Blog. 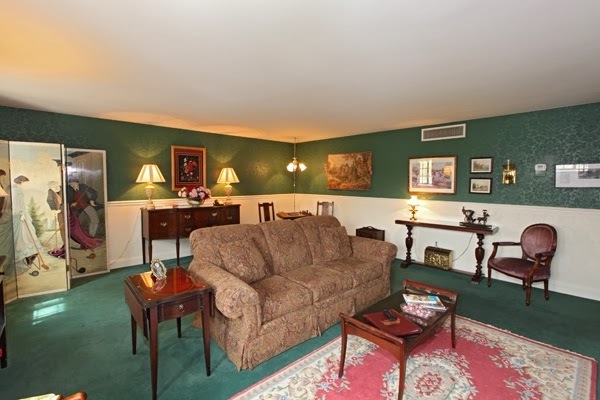 One of the unique and wonderful things about the Red Coach Inn is that each of our 35 rooms are different. From the layout, to the bedding, to the view and the decor each room has special highlights and amenities. The purpose of this blog is to help you learn more about each room here, so when you’re ready to book you know just which one to choose! This month we chose to feature one of our 2 bedrooms suites, the Stratford Suite. Last month's featured rooms were our banquet rooms, the Niagara Room and the Rainbow Room. If you missed it you can CLICK HERE to catch up! The Stratford Suite is located on the second floor of the hotel, and there are no elevators, so if stairs are a problem we recommend booking a first floor room. The trip up the stairs is well worth it, the Stratford has a stunning view and you can open the windows and listen to the roar of the rapids! 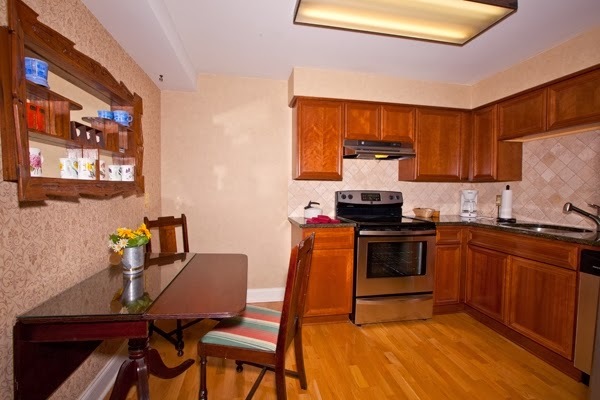 Inside the 1,125 square foot suite you will find 2 bedrooms, a full kitchen and living room. The first bedroom has beautiful blue textured wallpaper and matching comforter. The queen bed is set back in its own enclave and has drop down currents, which not only makes the room bigger, but gives it an awe effect. 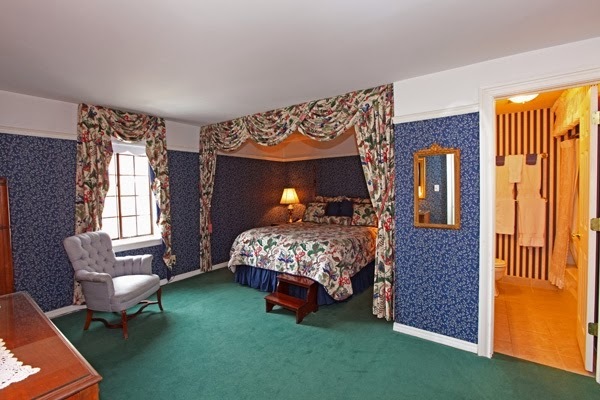 This room also has a full private bathroom in it with a jetted tub and double closets, as well as a 32inch television. 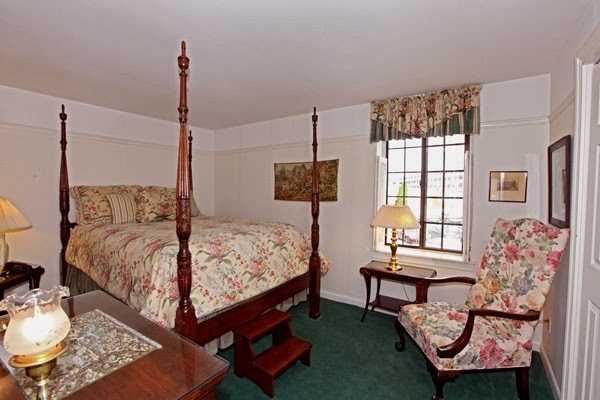 The second bedroom is a little smaller and has a stunning 4 post queen bed in it and a seating area! This room has also has a closet and chest of drawers. In the kitchen you will find a refrigerator, stove, dishwasher, microwave and coffee maker, as well as all your flatware and cookware. The living room boasts not only stunning views, but also a flat screen television, pull out sofa bed and a gas fireplace. There is also an antique chess table, for you to enjoy! And don't forget to leave us a note in our guest book! We hope to see you soon! Make your Valentine's Day one to remember with a romantic dinner at the Red Coach Inn. Our exclusive Valentine's Day menu is the perfect indulgence for your Valentine's Day Dinner. Valentine's Day is a day to celebrate the love you have for another person, and here at the Red Coach Inn we want to make it one to remember. With exclusive restaurant specials and several romantic packages to choose from we have the perfect setting for your Valentine's Day getaway. Our exclusive menu is the perfect indulgence for your Valentine's Day dinner. 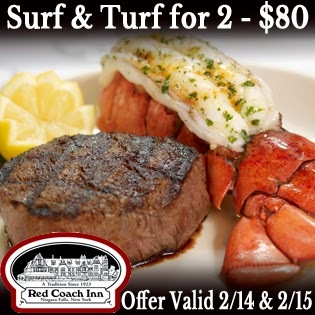 Enjoy our Surf and Turf Special for 2 for $80. 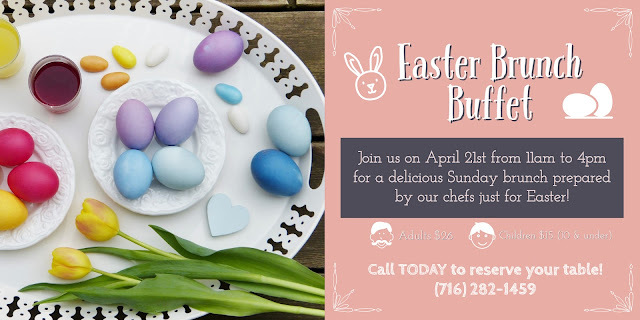 Special includes 2 house salads, 2 surf & turf dinners, and 2 chef's featured desserts. 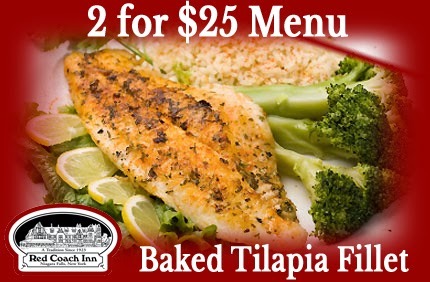 Offer valid 2/14/14 and 2/15/14. CLICK HERE to view our entire Valentine's Day Menu! So many romantic memories are made at Niagara Falls. The stunning beauty of the Falls is an amazing way to celebrate you love for your someone special, and we have a variety of packages to set the perfect mood. 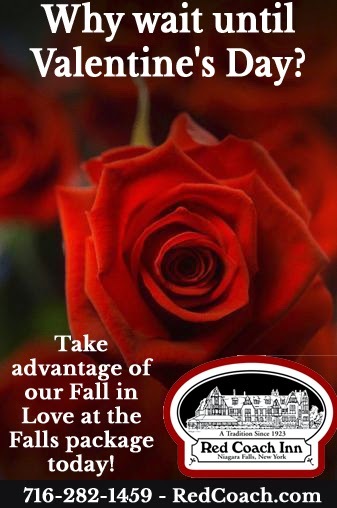 Choose to add our Fall in Love at the Falls package for an additional $75. This package includes a dozen roses, a $50 restaurant certificate for the Red Coach Inn restaurant, champagne and strawberries. We also offer a Traditional Romance Package which includes champagne, a box of chocolates, scattered rose petals throughout the room, and a $75 restaurant certificate. Add our Romance Package for an additional $99. Also if you are looking to head out for the weekend check-out our Be Mine with Wine ticket package, which includes 2 tickets to the Niagara Wine Trail's Be Mine with Wine event. Spend the weekend with your sweetheart sampling wine paired with chocolates from local chocolatiers. Tickets are valid for all three days of the event and include a tasting of 3 wines and a chocolate sample at each winery, and a commemorative wine glass from your starting winery. CLICK HERE to learn more about all our romantic Red Coach Inn packages.